Today, we will resume our discussion about qaṣīda “Arāka ‘aṣiyy al-dam‘ ”. 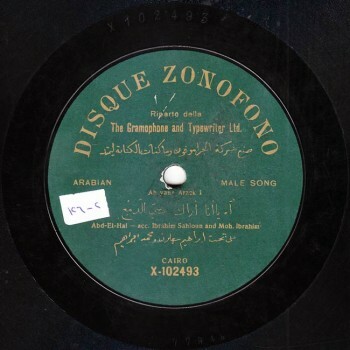 Let us continue with ‘Abd al-Ḥayy Ḥilmī, this time in another recording made by Zonophone. … as well as with Odeon. … he chose to chant it to the sīkāh maqām. And he did indeed start it to the sīkāh. But note what is going to happen: approximately 10 to 15 seconds later, he goes back to the habitual bayyātī, and only returns to the sīkāh in the last seconds of the recording. “Arāka ‘aṣiyy al-dam‘ ” to the sīkāh maqām is outside the habitual structure. In all cases, it remains just an attempt –a failed yet pleasant attempt– where the muṭrib found himself unable to achieve his goal, unable to improvise a qaṣīda to the sīkāh maqām because of Al-Ḥāmūlī’s powerful model whose memory imposed itself to all. Anyway, he recorded it around four times. And we have the four recordings. One more, or one less recording… but that is not a big deal. Indeed. And we are lucky. This is a vain attempt after which all the great muṭribīn tried their luck in recording “Arāka ‘aṣiyy al-dam‘ ” until this qaṣīda became a test-like step a person had to pass in order to affirm his capabilities. True! So many recorded this qaṣīda. Umm Kulthūm, of course, chanted it marvelously. Abū al-‘Ilā Muḥammad had surely something to do with teaching it to her. It may have been the remembrance of the past or the scent of the past, but it is was also a test. 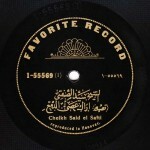 The recording was made around 1931, and “lāzimat al-‘awādhil” heard in the old recordings was only played as an introduction or as a lāzima accompanied instrumentally. But it had disappeared as an obligatory tradition that had to be performed as an introduction to the qaṣā’id. Shall we listen to an excerpt? You seem to have a surprise for us Mr. Muṣṭafa: a rare disc you finally found, and which pleasantly combines a popular instrument supposed to be used in popular music only, and this qaṣīda –this superior heritage. The album carries the title “ṭabl baladī (mizmār) Arāka ‘aṣiyy al-dam‘ ”. Muṣṭafa Sayyid Aḥmad al-Rashīdī is the mizmār player. While listening to this record, I was amazed at something besides his superior technical skill in playing this particular popular instrument –with its attributes and limitations. We have had this record for a few months only, still I was amazed at the way he interprets the lyrics as if the mizmār were talking. As if we were really hearing the mizmār uttering: “na‘am na‘am na‘am na‘am”. Wow! Did you hear the layālī ‘ala al-waḥda played by the mizmār at the end of the record side? Fantastic! I think that this is a revisited version, such as ‘Abd al-Ḥayy’s attempt to the sīkāh recorded by Zonophone. ‘Abd al-Ḥayy Ḥilmī’s failed attempt is the key to help solve the riddle of the piano. How is it possible to combine harmoniously the longing towards creativity and modernism and the preservation of the original? This is of course a well-worn dialectic, yet it captured the interest of the musical milieu throughout the 20th century. 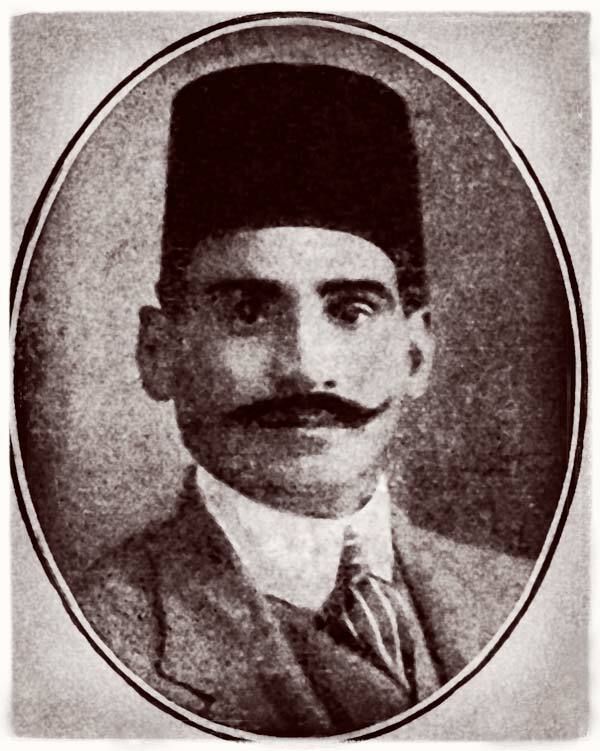 Here is Zakariyyā Aḥmad in the 1940s re-composing the qaṣīda. 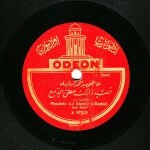 His version was interpreted by Umm Kulthūm in a recording that was lost, unless this concert was never recorded. It may even not exist. It does. We have proofs that Umm Kulthūm sang Zakariyyā Aḥmad’s new version. Who says that Zakariyyā Aḥmad was not adding variations to ‘Abduh al-Ḥāmūlī’s melody to the bayyātī, for example? I think there are some sources that mention that the melody is to the sīkāh maqām. Then he was surely influenced by ‘Abd al-Ḥayy. Here is Umm Kulthūm doing it again in 1964, because Al-Sunbāṭī answers Al-Saḥḥāb’s concert with a concert joining opposites: Abū Firās and the piano. He was exiled in Constantinople. Still, he is giving Umm Kulthūm the chance to remember her past. When chanting “Idhā al-laylu aḍwānī basaṭtu yada al-hawa” (If the night illuminated me, I would extend love’s hand), was she illuminated by the memories of her beginnings in the Azbakiyya… and would the ghost of Abū al-‘Ilā Muḥammad extend love’s hand towards her, or would it be the hand of reproach and blame? This qaṣīda is mostly mursala (non-metric), except for the short passage of “Mu‘allilatī” to the waḥda rhythmic cycle in the middle. Did he want to break the rule of the qaṣīda ‘ala al- waḥda all together? What do you think? As to the lyrics’ form, it is a qaṣīda where Al-Sunbāṭī is concerned, whereas musically, it is a monologue. According to the Egyptian musical practise, “Arāka ‘aṣiyy al-dam‘ ” is the scent of the past, the scent of heritage. Some tried to get rid of what in their opinion was dust on the heritage, but one knight alone went on defending Al-Ḥāmūlī’s legacy till the 1950s. In my opinion, Ṣāliḥ is a tragic character, a “Don Quixote” carrying a spear and attacking the mills. This same Ṣāliḥ ‘Abd al-Ḥayy who enchanted us –maybe in the late 1940s or early 1950s… it is very difficult to date this recording– with the most beautiful version of this qaṣīda, by uniting all the verses chanted by the muṭribīn: such as a specific verse that existed in a certain recording and not in another… he performed them all and attained the peak of ṭarab. In your opinion, were they interpreted in this way in live performances? Did he reflect a live performance? Honestly, I am not a hundred per cent convinced that Ṣāliḥ ‘Abd al-Ḥayy’s recording made in the 1950s or at the end of the 1940s reflects a live performance. First, because it is almost completely free from repetition, each sentence has a different style. A live performance would necessarily include repetitions or ornamentations and articulations. In my opinion, this one was set yet contains improvisation elements. Still, it represents the sap of Ṣāliḥ ‘Abd al- Ḥayy’s 50 years’ experience. At the end of the day, no one could stand every 3 and a half or 4 minutes to tell him to turn the record. Wow! There is nothing left to add after listening to the great Ṣāliḥ Afandī ‘Abd al-Ḥayy! Dear listeners, we have reached the end of our discussion about qaṣīda “Arāka ‘aṣiyy al-dam‘ ”. We thank Prof. Frédéric Lagrange for his presence with us and for his great analysis and explanation. We will meet again with a new episode of “Sama‘ ”.